THE COMMON PLATFORM FOR MANY EXPRESSIONS . . . . . Exotic Echo is a COMMON PLATFORM for people from multiple fields who have come together to make a difference to the rural population the world over. Exoticecho.com has been conceptualized with a vision to bring to its readers the social needs of the rural folk and the measures Exotic Echo has undertaken to ameliorate their hardships. The portal also adequately reflects the untiring and sincere endeavour of Supporting Self Help Groups rooted in rural India which are engaged in the social uplift of the underprivileged village folks. GUARANTEED WORK FOR 365 DAYS FOR RURAL WEAVERS. Exotic Echo’s present initiatives are in the field of creating rural employment. Exotic Echo is engaged in providing guaranteed employment to 20 Below Poverty Line (BPL) weavers in Nagaland and 05 in the Ukhrul District of Manipur. 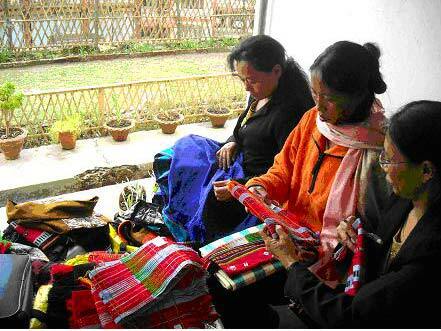 Plans are afoot to add 05 more weavers from the Ri Bhoi district of Meghalaya. DIABETES SCREENING FOR RURAL POPULATION. Exotic Echo VOLUNTEERS are screening the rural population for diabetes in areas of Nagaland, Meghalaya, Assam and Manipur. India unfortunately has been tipped to become the Diabetes Capital of the world in the next decade. Diabetes as an ailment is a silent killer and yet does not figure on the radar of the National Rural Health Mission because it is perceived to be a rich man’s ailment. Our initial work in this field is breaking that myth as we are finding that nearly 18 % of the sample size in rural India needs to be educated and managed for the ailment. Additionally, this portal also gives the visitors an insight into the work philosophy of all its supporting members and individually tries to showcase their multidimensional passion and enthusiasm in the fields of TRAVEL, DESIGN CONCEPTS and FILM PRODUCTION. Exoticecho.com is therefore an attempt to showcase FOUR MAJOR areas of interest that include SUPPORT FOR SELF HELP GROUPS, travel, design concepts as well as film production. The site apart from giving out the social initiatives being undertaken will also provide tips on travel, design and have a list of documentaries on North East India. Indranil Biswas fondly known as Neel to his friends has conceptualized the travel theme and all other related information on travel. He has been able to offer the readers with a scintillating account of a large number of travel hot spots in India by virtue of his rich and diverse personal experiences that he has gained by exploring more than 1.82 million kilometers of land in India and other parts of S.E.Asia in the last 35 years. The design related concepts that the website offers to its readers have emerged from the personal experiences and work of Ipsita, Mushtaq and Jayanta. Their expertise in this sphere will serve the readers in good stead and will be a source of unique ideas and visions. Readers can take the help of novel concepts and themes to fulfill their requirements. Ipsita Biswas and Mustaq Ali are well known figures in the realm of Design and Decoration. They have 18 years of valuable experience to offer to the visitors in this realm of decorative art and design. Jayanta has also acquired a competence in the realms of design and creativity. The distinguished team of Jayanta, Ipsita and Mustaq will be a real treasure trove for our visitors. Our film making basically portrays the work of Mubeen and Tinat who have been engaged in film production extensively and endeavor to bring forth the variety and richness of N.E.India. Readers will find separate pages connected to each of these specialized activities. What binds these different people and their different interests together is their attempt to join hands with SONNIE KATH who heads the ECHO SELF HELP GROUP. Collectively, they are trying to make a difference to the lives of rural people by creating sustainable employment. Anjishnu Biswas who has worked with a number of renowned portals in various capacities as reporter, sub-editor and special correspondent will assist us in his position as Content Editor for our team.